By including Conspirare in your estate planning, you ensure that innovative choral works will continue to be created and performed in Austin and around the world. When Conspirare first formed in 1991, we envisioned sharing with you our musical gifts that are inspiring, encouraging and sublime. We view choir as a symbol of community with the power to open hearts and transcend human and cultural differences. If you have that same vision for Conspirare, then a planned gift can become your ultimate demonstration of commitment and support. You can help us plan for our future — and your own — through this creative approach to philanthropy and estate planning which allows you to make a significant contribution to Conspirare while also enjoying income and tax benefits for you and your family. A number of Conspirare’s loyal supporters have informed us that they have made a provision for Conspirare in their estate plans. These gifts range from outright donations, percentage of residual, specific gifts of property and other forms of estate plans. Planned gifts ensure that your legacy of support will continue for generations to come. If you would like to learn more about how you can include Conspirare in your estate plans, please contact Ann McNair at 512-476-5775 or send Ann an email. It’s been more than a year since my friend Lew died. He was a man of the world, an elegant man, and yet being with him was as easy as listening to music. And that is a lot of what we did. From a young age, Lew was fascinated by differences among nations, and the Foreign Service seemed to be a way to help the world. During WWII, he served as an infantry lieutenant in the Pacific theatre, where he was seriously injured and received a Purple Heart. After recovering, Lew pursued his dream of a Foreign Service career. He earned degrees from George Washington University’s Fletcher School of Diplomacy and continued his training at other elite universities. His career took him to Paris, Istanbul, Tehran, and the Congo, where he received recognition for his work as U.S. Consul during the Congolese uprisings in the 1960s. He later served in Algeria and as U.S. Ambassador to Cameroon and Equatorial Guinea. His last diplomatic post was as Special Assistant to the U.S. Secretary of State, Coordinator for Combating Terrorism. After retiring from the Foreign Service, Lew worked as Consultant for International Affairs for Shell Oil. 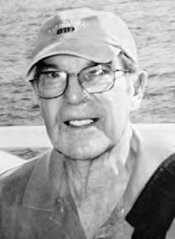 Professionally, Lew was described as a man of action, intelligence, and adventure; but such adjectives do not tell us about the beauty and grace of his life. A gentle, sensitive, and witty man, he was unfailingly humane. He wanted to know not only about the governments and policies of the countries where he served, but also their music, art, and character. He observed and listened. In retirement, he set about filling his life with the arts he loved and with caring service to others. He lived in several cities, at last choosing Austin in part because it celebrates the arts. He encouraged and supported artistic endeavor, especially music. He attended the symphony, opera, and ballet, but his passion was for the music of Conspirare. He loved, as he said, “the excellence and depth of each performance.” We attended together for many years, and if one of us missed a concert, the other would describe it (usually gloatingly). Lew was in Hospice Austin’s Christopher House at the end stage of a terminal illness, and I often visited him there. His two beloved daughters were also with him. The day before he died, I sat with him for eleven hours, watching the daylight evolve from dawn to dusk and listening together to Conspirare music as it swelled and quieted. Lew was silent, but an occasional soft hand squeeze let me know he was still there. It was almost a meditation, and a most precious time for me. He seemed comfortable, grateful for a life well-lived and the gorgeous music of Conspirare. He died the next morning. Some months after his death, Conspirare was surprised to learn that Ambassador Hoffacker, a faithful ticket buyer and annual donor, had made a substantial bequest to our organization. We are honored and deeply grateful, and hope other friends of Conspirare will follow his generous example.